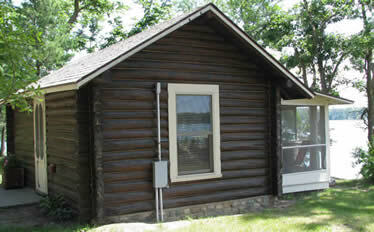 Our three lakeside historic log cabins provide an alternative camping experience. Built by Finnish craftsmen in the 1920s, each single-room cabin features a spacious living/sleeping area. 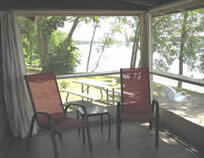 Picture yourself savoring a cup of coffee or playing cards with the kids on the large, screened-in porch with its expansive lake view. A picnic table and firepit let you enjoy meals outdoors and spend evenings around the campfire. The cabins have two double beds with bedding, dining table and chairs for four, and a kitchenette furnished with dishes, utensils, glassware, pots/pans, potholders and stove and refrigerator. There is no running water, but the shower house is just steps away. You will need to provide your own bath/beach and kitchen towels. A fishing boat with oars, cushions and lifejackets comes with each cabin. You can rent a motor at the office. Copyright © 2010-2015 Campers' Paradise. All rights reserved.